Which Color Wedding Dress Should I Choose? When choosing the color of your wedding dress, there is a lot to consider. Will it complement your skin tone? Will it match your personality, and fit with your style of ceremony? Here, we consider some of the available colors: White, Ivory, Champagne, Red, Light Pink, Pastel Shades, Bright Colors and Black. Not buying a wedding dress? Read our article on Dress Colors. The most popular choice for weddings, this traditional color symbolizes purity. The tradition of the white wedding dress dates back to the Victorian era, when Queen Victoria wore a white lace gown to marry Prince Albert in 1840 – prior to this brides tended to favor colorful gowns, including more “practical” colors such as browns and blacks that could be worn again and again. The color white can also be referred to as “Pure White”, “Diamond White”, “Stark White” or “Bright White”. White will look good alongside all other colors, so choosing a white wedding dress will not limit your choice of wedding colors or flowers. However, many skin tones can struggle to pull off this color, so make sure it suits you if you decide to choose it. Try It: White can look great on brides with darker skin tones, and those whose skin has yellow undertones. Its popularity means that it is suitable for almost every style of wedding, especially more traditional ones. Avoid It: Fair skinned brides may find a pure white color leaves them looking “washed-out”, and may wish to opt for an ivory color instead. Another popular choice, this color is ideal for brides with fairer skin tones, who may struggle to pull off a brighter shade of white, but who still want a traditionally colored gown for their big day. Ivory is a darker white, with yellowy or creamy undertones, and is sometimes referred to as “eggshell” or “candlelight”. Historically, ivory was seen as a “less pure” color, and was worn by brides who were getting married for the second time. However, nowadays, it is accepted that ivory is chosen because it’s more complimentary to the bride’s skin tone, rather than for any other reason. If you opt for an ivory dress, you may wish to ensure all other wedding details (such as white flowers, tablecloths, cake icing, shoes) are an off-white or cream color too, rather than white, as a brighter white will simply highlight the difference in color with the dress. Try It: Ivory is perfect for fair-skinned brides, red haired brides, and anyone else who does not suit the purer white color, but still wants a traditionally colored gown. Avoid It: Ivory is generally not suited to brides whose skin has olive or yellow undertones. Champagne has been an increasingly chosen color amongst brides over the past few years. A shade darker than the already popular Ivory, Champagne wedding dresses have pink and gold undertones, and are a similar color to the well loved drink of the same name. This slightly darker color can give your wedding gown a vintage feel and elegant appearance. It is common for a gown to feature both ivory and champagne colors, rather than just champagne, as the contrast between the two colors can emphasize and highlight details, such as embroidery, on the gown. In terms of choosing your wedding colors, Champagne works very well with a variety of colors, especially dark browns, such as chocolate, and dusty pinks. Try It: Ideal for brides with medium skin tones, or darker skin, this slightly darker shade is a great alternative to the traditional whites and ivories. Avoid It: Fair skinned brides may find that champagne is a little too dark for them, and may wish to stick to ivory. Brides should be aware that, whilst still a traditional color, champagne, unlike ivory, is noticeably darker than white. Red is easily one of the most romantic colors! The traditional color in many Asian cultures, including China and India, red is said to symbolize luck and auspiciousness. It is most popular amongst brides marrying in the autumn or winter seasons. Bright red is a bold color, and is perfect if you have a confident, outgoing personality, whilst darker red is a little more subtle. Red wedding dresses often complement the red color with white or ivory, and the amount of red on the dress can vary from completely red, to a few red details, such as a sash or embroidery, on an otherwise non-red dress. Try It: With so many reds to choose from, you’re certain to find one that suits you! Ladies whose skin has yellowy undertones look best in bright or orangey reds, while ladies with more pink undertones are best suited to “cooler” reds, i.e. reds that have more blue in them than they do yellow. Avoid It: This eye-catching color will ensure you’ll truly stand out, and you’ll need an equally out-going personality to pull it off. If you are more of a shy bride, you may want to consider a less attention grabbing color. This feminine shade has been gaining popularity amongst brides over recent years, and you will now find a number of wedding gowns that are available in a light pink hue. A wedding dress in light pink will allow you to add a splash of color to your big day, without straying too far from the traditional. Also referred to as “pale pink” and “blush”, there are a number of different shades of light pink available – brides with yellow undertones in their skin will find that pinks which are more yellowy (such as a peach based pink) suit them better, while brides with pinker skin or blue undertones will find pinks with a hint of blue or silver look best on them. As with all colored gowns, if you want to try light pink without committing to a completely pink gown, why not try a white or ivory dress with a pink sash or appliqué. Try It: If you want a fun, girly alternative to the traditional white dress, this could be the color for you. Avoid It: Ladies with lighter skin tones, particularly if their skin also has pink or rosy undertones, may wish to consider ivory, or perhaps a brighter pink, instead. As well as the light pink shade mentioned above, other softer shades are becoming more and more popular. Blue symbolizes purity and virginity, green symbolizes harmony and fertility, yellow symbolizes joy and happiness, and purple symbolizes wealth and ambition. If you choose to opt for a lightly colored gown, you may wish to choose a contrasting style of dress for you bridesmaids to ensure you stand out – whether they wear similarly colored gowns in a contrasting style (for example shorter hemlines when you choose long), or a differently colored dresses (for example black dresses, with a sash matching the color of your gown). Try It: If you want an alternative to the traditional white gown, but don’t want to move too far away from tradition. With so many colors to choose from, you are sure to find one that you like and that suits you! Avoid It: If you would prefer a lot of choice, you may wish to opt for a more traditionally colored gown, as there will be more styles available for you to choose from if you decide to go for white or ivory. If you want something a bit different, why not try a brightly colored wedding dress! It will certainly make you stand out, and be remembered by your guests for years to come. With so many colors to choose from, you will surely find one you like, which suits both your skin tone and your personality! But be warned, there will always be someone who will question why you didn’t opt for a traditional white gown – make sure you are confident enough with your color choice that such comments won’t bother you. 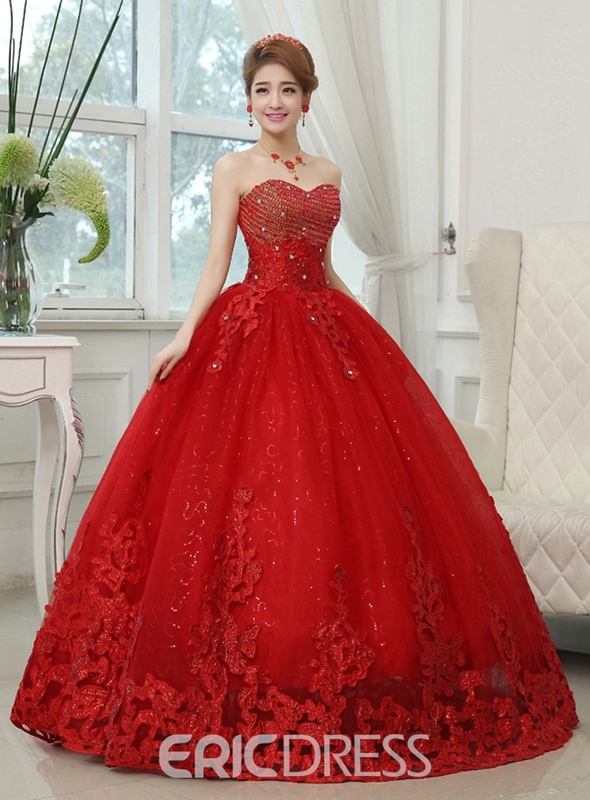 Since brightly colored wedding dresses are generally less popular, you will probably find you have a smaller selection of gowns to choose from, so you may instead decide to choose a white dress and have it dyed, or explore the range of prom dresses available, which, in many cases, can be formal enough to fit the occasion. Try It: If you want to shun traditional, or want to choose something a bit different that shows off your unique and quirky personality. Avoid It: If you want something a bit different, but don’t have the confidence to pull off a brightly colored gown, or are worried it will look out of place on your big day, you may wish to choose a pastel shaded gown instead. It might not be the first color people think of when choosing a wedding dress, but non-traditional black has slowly been gaining popularity over the years. It can add a touch of drama, mystery, and sophisticated elegance to your dress, and has the added bonus of being a rather sliming color. Plus, you won’t need to worry about keeping it clean throughout the day in the same way you might with a white gown! Historically, black was a popular color for wedding dresses prior to the Victorian era, especially in Scandinavia. If you want to try black, but don’t want an entirely black gown, you may wish to consider a white or off-white gown enhanced with black lace appliqué, or a black belt or sash. Try It: Perfect for gothic themed weddings, and for brides that want something a bit different. Black has the added bonus of looking great on most colorings and skin types. Avoid It: If you are dreaming of a traditional gown, this dark color probably won’t be right for you. Similarly, if you are planning a more traditional ceremony, make sure that a black gown won’t look too out of place.